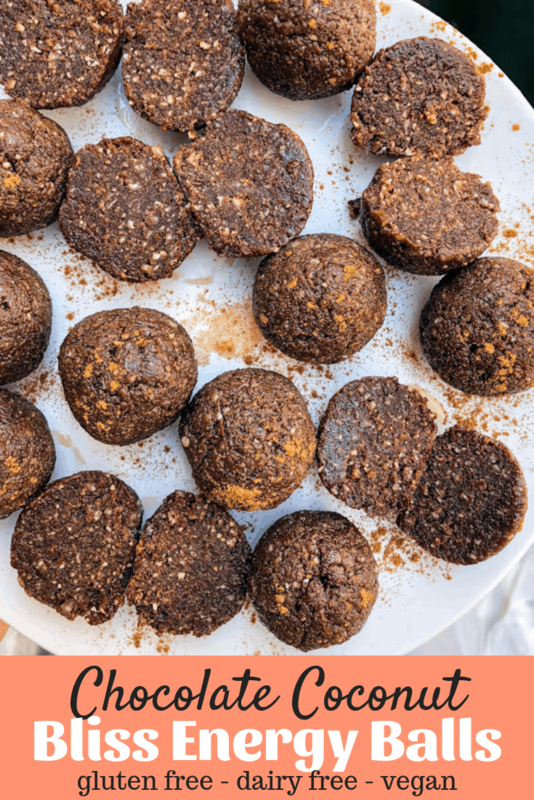 When you need a quick and easy snack, I’ve got you covered with these chocolate coconut bliss balls. They are filled with protein, low in sugar, and are perfect for on the go snacking. Erin Lives Whole otherwise known as Erin Lives Whole(ly on protein balls). But really… like every single day that I’m working from home or out and about getting work done, I can promise you I have eaten an energy or protein ball that week. It’s the one source of prepared food that I will always have in my freezer and I make all different types so I can always have options. 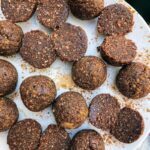 My OG protein ball recipe is definitely my favorite, and if you’ve followed me for a while then you know I make them all of the time. My dad literally begs for me to make them on the regular, so I try to always keep our fridge and freezer stocked with them. 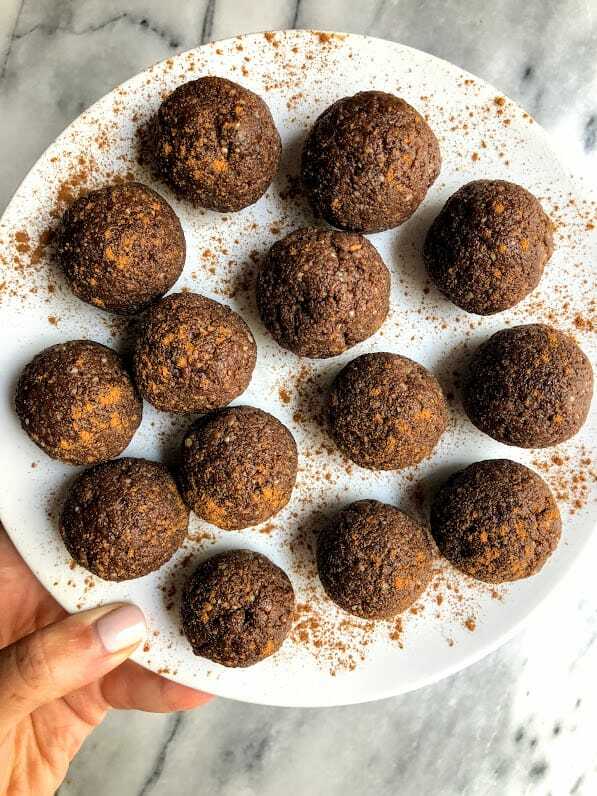 I think the thing about protein balls, aka these chocolate coconut bliss balls, that I love the most is that you can literally throw a bunch of ingredients into a food processor that you *hope* will blend together to create a substance that will hold together and resemble a protein ball. I mean some of the times you really don’t even need a food processor, you can just blend it all together by hand. Snacks, baby, quick and easy snacks are the key to making me happy. I’m always curious to see what kind of snacks people eat during the day and I remember when I worked in corporate America I always loved to see what people would leave in the fridge or what they would have on their desks. I remember that this one guy would always have these ‘Fit&Active’ weight loss shakes and I would just cringe at them. One of the days, I picked up one of the bottles from the fridge and the list of ingredients was actually horrifying. Like straight up sugar, chemicals, weird protein powders, and things that probably just made his stomach hurt so bad so yeah, he wouldn’t want to eat again, aka the ‘weight loss’ part of it. Things like weight loss shakes never made any sense to me, like why not just eat real, wholesome food made from ingredients you can actually pronounce and you actually know where they are from? I mean granted, I still eat other foods that aren’t perfectly ‘clean’ all the time, but if it’s up to me for afternoon snacking, I’m always down to have real food. 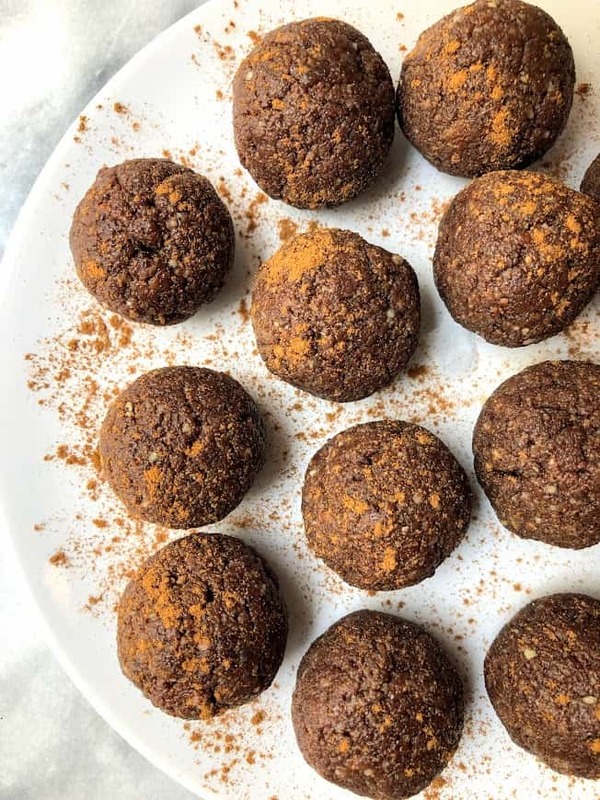 That’s where energy balls like these chocolate coconut bliss balls come in. In a food processor, blend cashews until very fine. Add in dates and coconut flakes and blend. Add in maple syrup, cocoa powder, and salt. Blend until smooth, adding water as needed and scraping down sides. Once completely smooth and combined, wet hands and roll into balls.